(NaturalNews) Lately, it seems that fast food restaurants are jumping on the "get healthy" bandwagon, doing everything from displaying the calorie content of their meals to hyping up the fact that they now serve salads. Because we all know that a salad will offset the health problems one can incur from ingesting a triple-stacked burger topped with bacon every day, right? Among the latest to get on board with this quasi-health trend is Burger King. 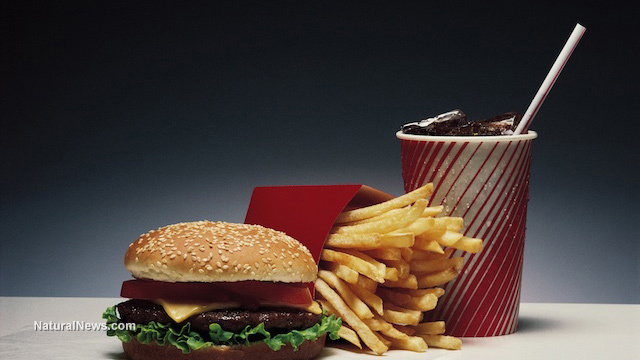 The fast food giant has declared that soda will no longer be the main beverage offered with their kid's meals. Instead, healthier options will be offered. According to a FastCompany.com article on the subject, "Now Burger King...will recommend its franchises offer fat-free milk, low-fat chocolate milk, and apple juice as the default beverage options on its children's menu, instead of soda." Rethink the drink: Is replacing soda with juices or chocolate milk really healthy? Soda has long been on the radar of health conscious people who advocate avoiding the sugar-laden drink. For example, you may recall the controversy that developed years ago when New York City mayor Bloomberg, in an effort to fight the obesity epidemic, wanted to ban the sale of super-sized sodas in the city, something which was ultimately rejected by the New York State Supreme Court. Still, awareness over soda and its contribution to obesity is top-of-mind for many people; it's not uncommon to see some medical waiting rooms or even some schools displaying a shelf of empty soda bottles filled with varying amounts of sugar to visually convey just how much it contains. While Burger King's move to omit soda as the default drink of choice for children is commendable, is it enough? Sure, it's a step in the right direction and for that, they should be somewhat praised. Any effort that has a person's good health in mind is good. "Soda and other sugary drinks promote diabetes, tooth decay, obesity, and even heart disease -- and have no place on menus meant for little kids," says Margo G. Wootan, nutrition policy director at the Center for Science in the Public Interest. "We applaud Burger King for taking this responsible step forward." However, we're not so sure that the likes of apple juice and chocolate milk is exactly oozing with "health." Consider that the Capri Sun 100% Apple Juice, which accompanies Burger King's children-sized chicken nuggets and burgers, has 20 grams of sugar per serving -- even more sugar than in Mountain Dew -- and suddenly things aren't looking as though they're brimming with health. As for that low-fat chocolate milk Burger King recommends as a soda alternative? According to their nutrition facts,[PDF] their 1% low-fat chocolate milk will have a child ingesting 25 grams of sugar. The American Heart Association recommends that children aged four to eight consume 12.5 grams of sugar daily. Burger King isn't the only place that's attempting to bolster their menu with healthy -- or at least healthier sounding -- choices. Wendy's recently added Veggie Sliders -- for a limited time -- to their menu. According to their site, this particular Slider is made with a blend of ingredients including carrots, soybeans, corn, garlic and parsley. Sure, this is a step in the right direction. Then again, the addition of corn and soybeans has GMO written all over it, so how healthy is this really? McDonald's too, has dipped their toe in the healthy pool, also attempting to do right by health-savvy folks. They've been increasing the amount of so-called healthy items to their menu and also caught many people's attention when they announced that they would stop using chicken that contained any amount of human antibiotics in them.